Will GBP/USD Break 1.30 on BoE? Expectations are also running high for Thursday’s Bank of England monetary policy announcement. GBP/USD has its eye on 1.3000 and the BoE’s outlook will decide whether that level holds or breaks. Judging from the resilience of sterling, investors are optimistic and there’s even talk of the central bank unwinding stimulus in the fall. Typically when the BoE changes their views, they like to coordinate it with the release of the Quarterly Inflation Report as it includes their latest economic forecasts. Although we recognize the improvements in the economy, we’re not sure enough has changed for the BoE to start talking rate hikes. August when the next report is released may be a better time to change their bias. With that in mind, there’s no doubt that Kristin Forbes, the lone dissenter at the last meeting will vote to raise interest rates again. However it is unlikely that she convinced other policymakers to do the same. Since March, there’s been more improvements than deterioration in the U.K. economy. Inflation and wages are up along with economic activity (per the PMIs) but consumer spending remains very weak and housing activity is slowing. We know that BoE Governor Carney is worried about how the economy will perform under Brexit but so far, the slowdown that he anticipated is not happening. So BoE hawkishness is not a given tomorrow which is why it is best to wait and see what the central bank emphasizes before taking a trade. Technically, if BoE is hawkish, we’ll see 1.3000 tested and probably broken at which point it should be a quick ride up to 1.3050. 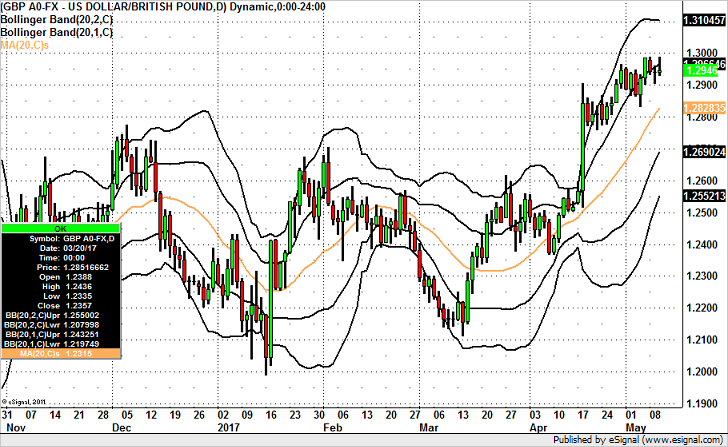 If they are cautious then GBP/USD will fall and could slip back down to the 20-day SMA near 1.2830.